Throughout the years, Dawn cemented her status as a leading voice within her desert community. 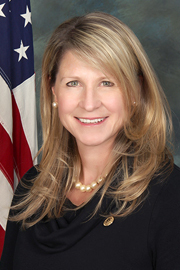 From advocating for increased Off-Highway Vehicle (OHV) access on public lands to eliminating burdensome regulations that stifle local economies, she is committed to making a difference. Following the death of her husband, Marine Corps Capt. Alan Rowe, during combat operations in Iraq, Dawn became involved in land development to support her family. However, after experiencing a number of setbacks due to onerous land-use restrictions, Dawn worked alongside her local elected officials to find creative solutions for thoughtful development in her hometown. Her tenacity and determination caught the attention of then-Mayor Chad Mayes, who appointed her to the Yucca Valley Planning Commission (2008-2010). Eventually, she was elected to the Town Council by Yucca Valley residents and served one-term before stepping aside to spend more time with her two children, Blake and Caitlin. Dawn received a Bachelor of Arts in Journalism from Drake University and a Master of Science in Advertising from Northwestern University. She resides in Yucca Valley and continues to substitute teach for the Morongo Valley Unified School District when she can.